Art Deco lamps, vintage not old, classy, stylish and beautiful as well as difficult to find if you are not sure what you are looking for exactly. Adorning your home with such works or art can give you the feeling and experience of a beautiful time in history back when craftsman took pride in their work. The Art Nouvedau style brought out the best of the designers of the age and the art deco lamps they produced were and still are a thing of sheer beauty. Some of the most beautiful designs and styles first appeared around 1920 and some of the top Art Deco Designers were from Paris where the lamps were considered a form of art and expression of each designer. The art deco lamps, as the name suggests are lamps that have been created for decoration and are a symbolic form of artwork. Jacques-Emile Ruhlmann was one of the more famous designers of art deco lamps and for that reason his lamps are now some of the most sought after designs. He was well known for his flamboyant styles in both his lamp designs as well as his lifestyle. Ruhlmann was as much as marketer in his day as he was a designer as he often held special events in which he would highlight his own collection throughout Paris in the mid 1020's. There were however many sought after designers back then with Edgar Brandt also leading the list of famous designers. Traditionally, Art Deco lamps, chandeliers and sconces were made from steel, chrome or polished bronze. However another popular name among designers, Lalique had produced a variety of designs of milky glass table lamps, as well as many larger light fixtures for hotels and businesses. Other major glass-makers such as Daum Frères and Tiffany made Art Deco lamps which I guess you could say were not actually inexpensive for the time and still remain so. Gorgeous glass Lalique lamps and other lighting pieces were very popular and continue to be in hot demand today. Towards the end of the 1920s and into the 1930s, lamps were influenced by the more Modernist style which embraced the Machine Age and made use of the new materials such as chrome, nickel, steel, smoked glass, and Bakelite. In the USA this style was taken up by designers such as Von Nessen and Deskey and sold through all the big department stores from 1927 onwards and throughout the depression years. Shapes became more geometric and linear. Motifs such as parallel lines, sunbursts, fountains, and ziggurats were common. Many lamps were highly abstract with angular lines and mechanisms for directing the light in different directions. This created that shiny, sleek look that is most associated with art deco lamps. 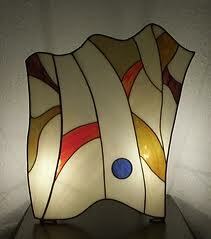 Glass or porcelain was used to fashion lamp shades - this contributed to the sleek aesthetic of Art Deco Lamps. In 1932 the famous angle-poise lamp was invented, which has survived ever since, and these are still as stylish and functional as ever. They were originally black enamel, but have been made in all kinds of materials including Bakelite. Symmetrical and repeating angular designs like zig-zags and chevrons were frequently engraved in metal lamp posts and glass shades that adorned the beautiful Art Deco Lamps. Steel or chrome with opaque glass are probably the most common of the Art Deco Lamps modernist materials, but there are a wealth of shapes and sizes to choose from. Standard lamps, or Torchères were often very tall, and designed to focus the light upwards. Instead of the old fashioned fabric shades with fringes, glass or metallic shades would diffuse the light evenly and upwards. Another classic feature of lighting from the 1920s is geometric pattern. Also, the glass would have been painted in bold colors like ruby red or sapphire blue. Bright colors were very trendy for the creation of spectacular Art Deco Lamps. 8 incha tall leg lamp A Christmas Story night light. Has real fringe on the lampshade portion. Plugs into any standard socket. The Hunter Fan 28872 is a Paxton Ceiling Fan with the Three Speed Pull Chain in the Antique Pewter motor finish. This Ceiling Fan is from the Paxton Collection and is UL Indoor rated. The Paxton Includes 3" (3/4" Interior Diameter) Pole. The Hunter Fan 21711 is a Grant Park Ceiling Fan with the Three Speed Pull Chain in the New Bronze motor finish. This Ceiling Fan is from the Grant Park Collection and is UL Indoor rated. The Grant Park Includes 3" (3/4" Interior Diameter) Pole.